"Once again, master percussionist Luis Conte gives us an exquisite experience with 'En Casa de Luis'. His artistry is, as always, in virtuoso display." Reviews for "En Casa de Luis"
"Rooted in the rhythms of his native Cuba, master percussionist and composer Luis Conte again takes us on an hypnotic and evocative musical journey with Marimbula." 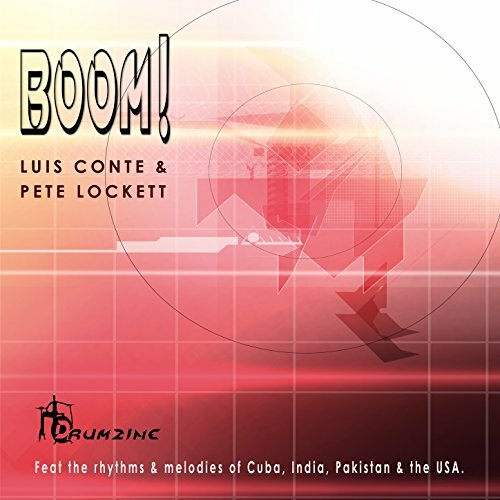 Grammy-winner Luis Conte is an acknowledged master of percussion. His celebrated career includes touring and/or recording work with some of the greatest names in contemporary music, including Madonna, Eric Clapton, Phil Collins, Santana (Supernatural album), Jackson Browne, Celine Dion, Barbara Streisand, Ray Charles, Tony Bennett, James Taylor, Shakira, Ozzy Osborne, Queen Latifah and Cuban legends Arturo Sandoval and Cachao. He can also be heard on the scores and/or soundtracks to such box office smashes as Transformers, Transformers 2, Hancock, Bruno, Superbad, the new Miami Vice, The Lost City with Andy Garcia, Mission Impossible, Rain Man, Waiting To Exhale, Coming To America, Drumline, Out of Time, The Italian Job, Oceans 12, Sideways, Disney’s animated Tarzan, Brother Bear and countless others. Luis is a percussionist for the orchestra on NBC's hit TV show, Dancing With the Stars. Endorsed by the Meinl and Zildjian instrument companies, Luis has designed his own signature series of instruments and drumsticks. His percussion clinic tours take him around the world teaching musicians the essentials and history of Afro-Cuban rhythm. Luis recently released his signature line of congas, timbales and shakers by Meinl, which were unveiled at NAMM 2005. Four percussion masters, global leaders in their respective disciplines, come together for a highly-charged musical exchange; explosive, unpredictable, and unusual. Doudou N’Diaye Rose (Senegalese master of the sabar), Chad Wackerman, (Frank Zappa, Allan Holdsworth), Luis Conte (Madonna, Michael Jackson), and Bill Bruford (Yes, King Crimson, Earthworks), are known internationally as the World Drummers Ensemble. Percussionist to some of the best artists in the world, Luis Conte, with David Garfield (piano) and Dave Carpenter (bass), explores the Latin side of jazz. Recorded in HiRes and with video angles and switchable mix perspectives. Sit onstage with the band or move out to the first row of the audience--the choice is yours. Cuban Dreams is a stunning feast for the senses and invites you to step further into the world of Luis Conte, the brilliant, innovative percussionist, composer, and arranger. Ten tracks capture the moods, sounds, and source of Luis Conte's musical heritage and enjoyment. Cuban Dreams chronicles Luis Conte's childhood experiences in Santiago de Cuba, through a myriad of rhythms and first-hand historical perspectives from the artist and his family members who serve as orators. Geared for the serious recording percussionist, this DVD gives a first-hand glimpse at the recording process of one of the most sought-after studio percussionists in the world. Luis Conte demonstrates the recording of basic tracks and the overlaying of additional tracks to complete a cut. Additionally, he shows how to create entirely different "feels" from a single basic track and how to record multiple percussion instruments within a single track (allowing the over-dub process to maximize the available number of tracks ). This DVD also highlights Luis' playing of congas, bongos, timbales, djembes, tambourines, cajons, shekeres, and more. Luis Conte has taken the Afro-Cuban tradition on hand percussion and applied it to all styles of music. Here he explains his approach to learning the tradition, and then making it your own. Luis's philosophy is 'Learn the roots, then do what you feel.' One dynamic segment of this tape includes a brilliant solo performance on congas, bongos, timbales, bells, chimes, shakers, shekere, tambourine and cajon which includes the following rhythms: marcha, songo, Afro-Cuban 6/8, abakuá and martillo. Other segments include: The importance of timekeeping, Thinking in phrases, Playing simply, Sounds of the shekere, and more. All of Luis’ specifications have been achieved with the MEINL Artist Series Luis Conte Signature Congas. They combine the charm and sound of the old traditional Cuban drums with modern features and innovations. The congas are equipped with traditional rims and are mounted as close to the shell as possible, and when combined with MEINL’s True Skin Buffalo Heads, enable an even more controlled sound and easier tuning. Billed as the continent's biggest and most popular drumming festival, and one of the largest gatherings of drummers in the world, "TUDW" is an annual event that brings together top drummers from around the world for three days of wall-to-wall concerts and workshops. Both TUDW 10 and TUDW 11 offer extensive footage of the events' performances and drum clinics as well as interviews and special behind-the-scenes coverage. TUDW 10 (2002) features Graham Morgan, Dave Weckl, Virgil Donati, John Tempesta, David Jones, Darryn Farrugia, Luis Conte, Dom Famularo, Gordon Rytmeister and Grant Collins. BLACK FOREST (1990) - Currently not available. LA COCINA CALIENTE (1987) - Currently not available.